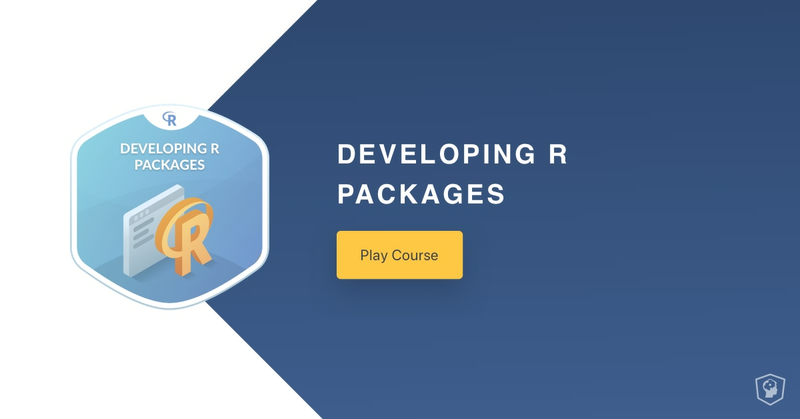 In this course, you will learn the end-to-end process for creating an R package from scratch. You will start off by creating the basic structure for your package, and adding in important details like functions and metadata. Once the basic components of your package are in place, you will learn about how to document your package, and why this is important for creating quality packages that other people - as well as your future self - can use with ease. Once you have created the components of your package, you will learn how to test they work properly, by creating tests, running checks, and building your package. By the end of this course you can expect to have all the necessary skills to create and share your own R packages. In this chapter, you will learn the basics of creating an R package. You will learn about the structure of R packages, set up a package, and write a function and include it in your package. You will also learn about the metadata stored in the DESCRIPTION and NAMESPACE files. In this chapter, you will learn how to document your package. You will learn why documentation is important, and how to provide documentation for your package, its functions, and other components. You will also learn about what it means to export a function and how to implement this in your package. In this chapter, you will learn about how to run checks to ensure that your R package is correctly structured and can be installed. You will learn how to correct common problems, and get your package ready to be built so it can be shared with others. In the final chapter, you will learn how to add tests to your package to ensure your code runs as expected if the package is updated or changes. You will look at how to test functions to ensure they produce expected values, and also how to test for other aspects of functionality such as expected errors. Once you've written tests for your functions, you'll finally learn how to run your tests and what to do in the case of a failing test.